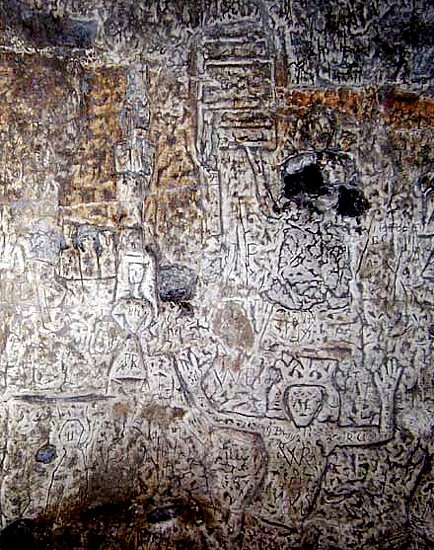 Royston Cave, the Knights Templar and The da Vinci Code: an underground conspiracy? Royston Cave is a fascinating and unusual monument in the small market town of Royston, Hertfordshire. It consists of an artificial bottle-shaped circular chamber in the chalk bedrock, originally around 5.2 metres (17 feet) in diameter and 7.7 metres (25 feet 6 inches) in height, with a band of strange carvings around the lower part of its wall. There are suggestions that it once held a wooden floor above the carvings, while there is an octagonal depression in the centre of the floor and a larger brick-lined depression (known since its discovery as ‘the grave’). It has been mired in controversy since its rediscovery in August 1742 and with each new generation, a new controversy is generated. The current controversy is over its alleged links with the Knights Templar (more correctly, the Poor Fellow-Soldiers of Christ and of the Temple of Solomon), a medieval religious order suppressed in 1312 and currently a focus of one of the most widely believed conspiracy theories of our times: the “bloodline of Christ”. Where to start? I have written about the Cave before, complaining that “[t]he first hit on Google takes the browser to a page that mentions the Knights Templar, the Masons, James I (alleged without evidence to have been a Mason!) and ley lines; it concludes that “The Cave is a mystery””. Yes, the Cave is a mystery, but many mysteries are capable of solution and, as this is a site with numerous carvings on its walls, it is one that might be solved by applying techniques of stylistic analysis. Local opinion since the 1970s has held that it was a shrine used by the Knights Templar, although the evidence for this assertion is inconclusive and alternative explanations are possible for its origins and the origins of the carvings (which need not necessarily be connected). Explaining a site that appears to be unique requires judicious use of Occam’s Razor and awareness of how easy it can be to jump to unwarranted conclusions. Had the site been rediscovered in recent years, it would have been the subject of careful excavation, one hopes. As it was rediscovered in 1742, though, it was simply cleared of its contents in the hope of discovering buried treasure. The clearance was done by shovelling the soil that filled the lower eight feet (2.4 m) into buckets hauled up using a block-and-tackle set up over the entrance shaft. The soil is said to have contained a human skull, a number of other bones, fragments of a small brown earthenware cup decorated with yellow dots and a piece of copper alloy plate. None of the material seems to have been kept, as no-one at the time understood that it could yield useful information, although some similar material was found in a twentieth-century excavation of the ‘grave’ in the Cave floor. The initial 1742 clearance does not seem to have been very thorough, as during a visit later in the same year, the antiquary William Stukeley (1687-1765) found a decorative pipeclay object with a fleur-de-lys design at one end, which he interpreted as a medieval seal die. The description of the cup fits a sixteenth- or seventeenth-century type known as slipware. Although slipwares were still in use at the time the Cave was rediscovered, they were going out of fashion and many older forms and styles would have been unfamiliar by then. 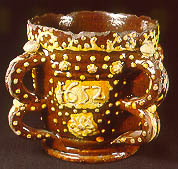 From the description given, there is no reason to regard this vessel as being any earlier than the sixteenth century; it certainly does not sound like a medieval type (brown with yellow dots was not a fashionable colour for pottery, while mugs were an introduction of the later fourteenth century). Similarly, the pipeclay object found by Stukeley is unlikely to be any earlier than the later sixteenth century. What we can deduce about the material found during the initial exploration of the Cave suggests that the fills date from the late sixteenth or seventeenth centuries, not the Middle Ages. This seems reasonable and fits with documentary evidence that suggests that the Cave was occupied by a hermit c 1506 and was purchased with the Manor by Robert Chester in 1540, after which we hear no more about it. Indeed, the same Robert Chester, who died in 1574, “buylded up in the myddest of Icknell Streate… a fayer House or Crosse… for a clockhowse and a Pryson Howse”, apparently above the site of the cave. This all sounds thoroughly consistent with a hermitage that did not survive the Dissolution of the Augustinian Priory in Royston and was forgotten by the end of the sixteenth century. What this doesn’t tell us, of course, is when the carvings were created or when the Cave itself was dug (assuming that the two are not necessarily connected). The carvings clearly include religious imagery (there is a large depiction of St Catherine of Alexandria, holding the wheel on which she was martyred, St Christopher crossing the river with a baby Jesus on his shoulder, a Crucifixion scene and St Laurence with a gridiron), but there are many others of more obscure character, including depictions of people wearing crowns (and one whose crown hovers above their head), and yet others whose precise interpretation is debatable. For instance, a figure identified by the eccentric and controversial archaeologist Tom Lethbridge as a sheela-na-gig and claimed to have pagan associations does not really resemble any other depiction of these figures (which, despite their supposedly ‘pagan’ meaning, are found in ecclesiastical contexts). The carvings are also naïve in execution: they were evidently not the work of a skilled artist and may not all be by one person. It is possible that they were created over many years, which would explain the jumble and occasional repetition. As the cave was in all probability used as a hermitage, it is reasonable to suggest that the carvings were made by its occupants, perhaps inspired by visions they experienced in the darkness of the Cave. Given that the carvings were probably created by people who were unversed in the techniques and canons of the high art of their day, how useful is it to apply Art Historical analytical techniques in an attempt to date them? Where they have been used, there seems to be no agreement. Sir Nikolaus Pevsner suggested that they are “probably of various dates between the C14 and C17 (the work of unskilled men)”, while Lilian Redstone in the Victoria County History of Hertfordshire thought that they were “probably carved in the 13th or 14th century”, with which the Hertfordshire Historic Environment Record concurs. Writing for The British Association for Local History, Joanna Mattingley suggested a late fifteenth-century date for some of the carvings and a seventeenth-century date for some letter forms. Evidently, we can’t get very far using stylistic analysis! So why has the standard interpretation of the carvings settled around the idea that they were created by the Knights Templar? There are two principal arguments used in favour of the identification: iconographic and stylistic. In the former case, it is suggested that there is a strong militaristic element to some of the carvings, with depictions of knights in armour. While there are armoured figures in the Cave, they are not numerous and at least one of them has been thought to represent either St George or St Michael (probably the former, as it has a George Cross incised on its chest). They appear to be wearing plate armour, which would date them to the fifteenth or sixteenth centuries, too late for the Templars. Moreover, the distinctive Templar symbol of two knights on horseback, intended to show that their self-imposed poverty forced them to share horses, is completely absent from the cave. As we have already seen, the stylistic arguments are contradictory over the date. An attempt has been made to compare the carvings with others said to have been made by Templars in the donjon of the Tour du Coudray in the Château de Chinon (Indre-et-Loire, France), where the carvings include hearts, Stars of David, grids and geometrical patterns. These are relatively commonplace devices and are not uniquely associated with the Templars. The Templar connection with the carvings has also been thoroughly debunked by Hervé Poidevin, anyway. 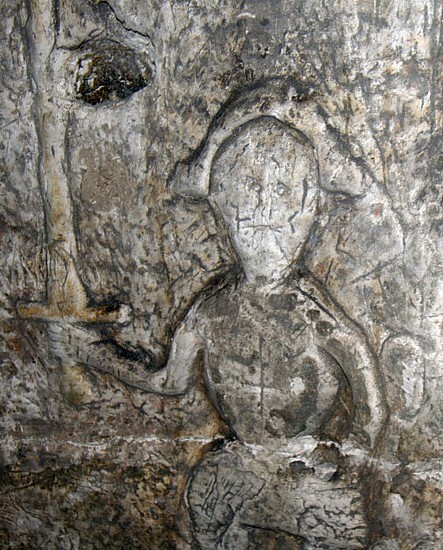 Nevertheless, the identification of the carvings in Royston Cave as products of the Knights Templar has become the standard interpretation, at least locally. This is despite the weakness of the evidence in favour of the hypothesis and the arguments in favour of a later date. It therefore becomes all the more disappointing to see further promotion of the cave as “A Knights Templar Mystery of History’ on the Heritage Daily website. The article, by Sue Carter, was published on 3 October and repeats the usual myths about the Templars uncritically, adding other elements of dubious authority into the mix. Sue Carter states that “Hertfordshire was a county used a lot by the Knights Templar. They had their main Preceptory in England at Temple Dinsley, now a girl’s school, as well as being associated with Hertford Castle, and owning the town of Baldock, just outside of Royston, as well as manors at Chelsing, Bengeo and Weston”. This sentence is full of basic errors. The only association of the Templars with Hertford Castle is that some members of the Order from Temple Dinsley were imprisoned there during the investigation of the Order in 1309; they did indeed found the market town of Baldock, which, far from being “just outside of Royston”, lies some eight miles (13 km) away and was a commercial rival; Baldock originated as part of the manor of Weston granted to the Order in the 1140s. 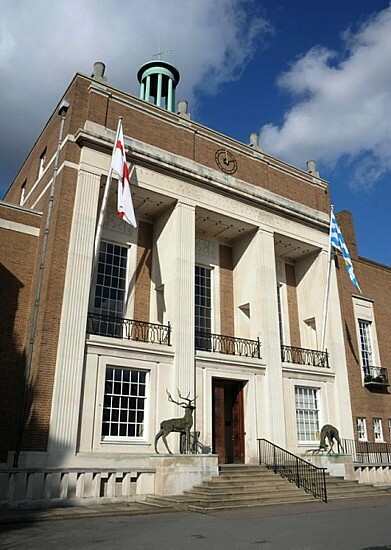 County Hall, Hertford: why would Knights Templar imprisoned at the Castle build tunnels to a building that did not exist before 1939? She continues: “[t]unnels were discovered under Hertford Castle in 2004 and have been attributed to the Templars, which ‘connect the dungeons at Hertford Castle with the County Hall and other locations’”. This was remarkably prescient of the Templars: during their brief imprisonment at the Castle, they were able to build tunnels linking their prison with a building that was not to be erected for another 630 years! County Hall was built in 1939; even the Shire Hall, with which Sue Carter may be confused, was not built until 1768-9. Her source for this tale of mysterious tunnels is The Templar Code for Dummies by Christopher Hodapp and Alice von Kannon (2007). A flavour of the book can be gleaned from part of its blurb, which proclaims that it “explores the surprising part the Templars have played in some of the most important historic events of these past seven centuries, including the French Revolution, the birth of groups such as the Freemasons, and even the American Civil War”. One can only say “gosh!”. It doesn’t really sound like a work of scholarly archaeology or history. Sue Carter then speculates: “[r]umours have grown rife since the discovery of the tunnels including a labyrinth under the county in order to move the vast amounts of treasure that the Templars are reported to have amassed over time. ‘One version suggests that the Holy Grail is concealed there. Another hints that it is the hiding place of the Ark of the Covenant’… But what does all of this have to do with Royston Cave?”. What, indeed! Her suggestion is that the Cave was used as a hiding place by fugitive Templars escaping to Scotland (the modern A10, which passes through Royston, was a Roman road that served as the main road to the north during the Middle Ages). I will await the publication of the discovery of this labyrinth in Hertfordshire Archaeology and History before commenting further. Just when you think it can’t get any worse, we are suddenly regaled with a passage from Joseph Beldam’s account of the Icknield Way, from 1849 (Sue Carter seems not to know that Beldam’s Ichenhilde Street is a bizarrely archaic form of Icknield Way that Beldam used for reasons best known only to himself). 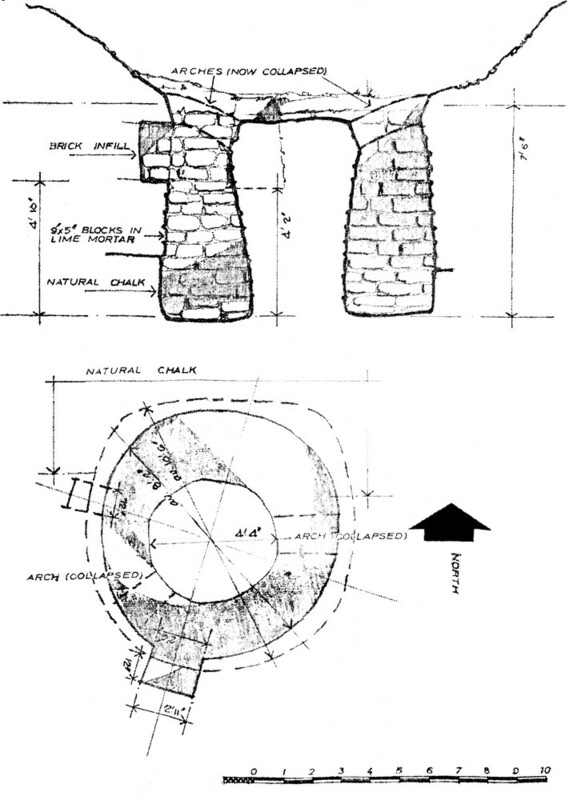 Using the passage as evidence for more “bone shafts” in the town, she fails to recognise the description of a well in Beldam’s “depth of 100 feet, terminating in a fine spring of water; but like the others, it had been filled up, at some remote period” or of a chalk-cut lime burning kiln in “a circular cavern beneath a low mound, the floor being grooved”, taking an antiquary from more than a century and a half ago as an authority for interpretations that are clearly wrong. This is poor research! She suggests that “a full geophysical and archaeological survey of the town needs to be undertaken”, unaware of Neil Smith and Catherine Ransome’s Extensive Urban Survey Assessment Report, available since 2001. This provides a good overview of the town’s archaeology, although it did not attempt “a full geophysical… survey”, as such a project would be ludicrously expensive and of dubious value in an historic town, where a depth of complex stratigraphy can be expected. However, there are unconfirmed reports that a second potential cave has been identified in Melbourn Street. A ground probing radar survey was carried out in February 2008 as part of the filming for a television series, Quest, which promotes a Masonic conspiracy theory about the origins of the Knights Templar; the series was never aired in the UK but went straight to DVD release. In view of the sensationalist nature of the programme, doubt should be cast on the claims. I have written so often about the supposed “Bloodline of Christ” that it’s becoming tedious to have to debunk it every time it’s raised. 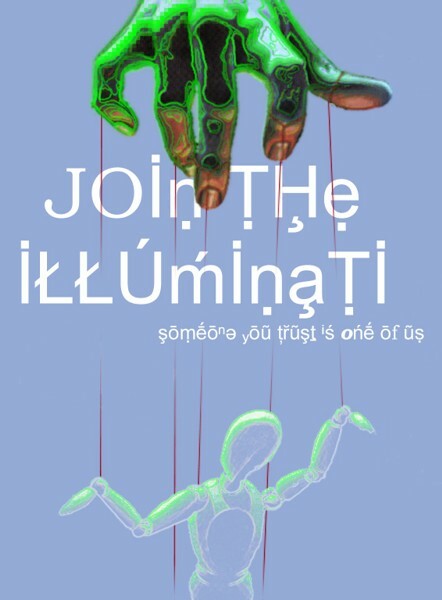 The Prieuré de Sion did not exist before the 1950s, Freemasonry has no connection with the Knights Templar, there is no shadowy conspiracy directing the history of the western world run by Knights Templar/Masons/the Illuminati/the Grand Master of the Prieuré de Sion/a descendant of Jesus of Nazareth (delete or combine as appropriate). Get over it. The Knights Templar disappeared from history following the disbanding of their Order in 1312; Freemasonry as an organised set of beliefs did not exist before the later seventeenth century, at the earliest; if Jesus had one or more children, he could potentially have millions of descendants alive today. There is little point in pursuing these conspiracy theories of history. Conspiracy theories are popular, though. They have an emotional appeal that mainstream history does not. They place the believer in a privileged position, making them feel wiser than academics, more in tune with the way the world works than the rest of the population and able to see through the guile of politicians. They don’t need to follow the boring, analytical methodologies of traditional historians: in a very telling passage, the authors of The Holy Blood and the Holy Grail dismiss analysis and talk grandly about how “the techniques of academic scholarship were sorely inadequate… we were obliged to adopt a more comprehensive approach, based on synthesis rather than conventional analysis”; in other words, they announced how they were prepared to accept data that in ordinary circumstances really ought to be ignored as worthless. We see exactly the same attitude in Sue Carter’s parting comment that “you just cannot ignore the connections and possibilities of these sites and their hidden histories”, which is typical conspiracist thinking. Many of the connections just don’t exist while the possibilities turn out to be exceedingly remote and not worth pursuing. It is a sad reflection of modern education that so many people can grow to maturity lacking the critical faculties that would enable them to see through many of the false stories they are sold in the name of history. It is even more worrying that in an age when access to information is almost instantaneous, thanks to the internet, that people either cannot be bothered to check basic facts (a shocking lapse when it comes to journalists) or are prepared to accept anything they read that challenges the mainstream view of how the world works. Any suggestion that the supposed Templar connection is dubious, even wrong, can be met with hostility. 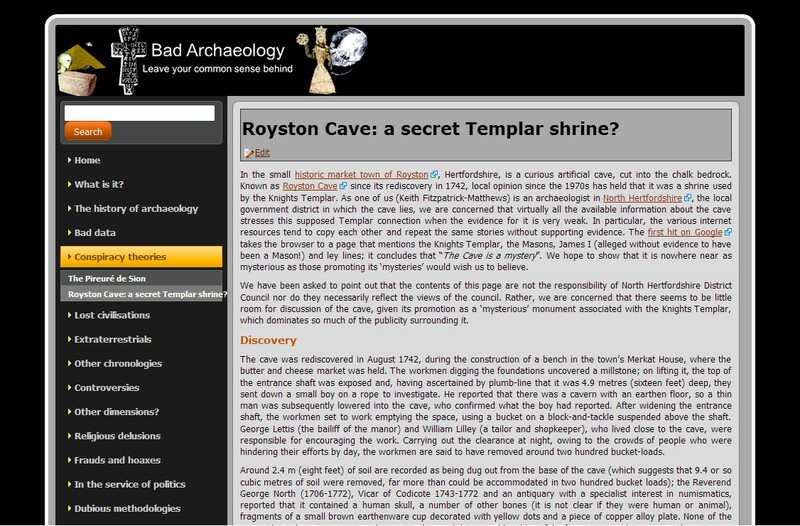 As I state on the main Bad Archaeology site, I work in the local government district in which Royston Cave lies, but when I first posted the original article in March 2008, a complaint was made about it to my manager. Not to me, not via the contact email address on the site or my work email, but to my manager. 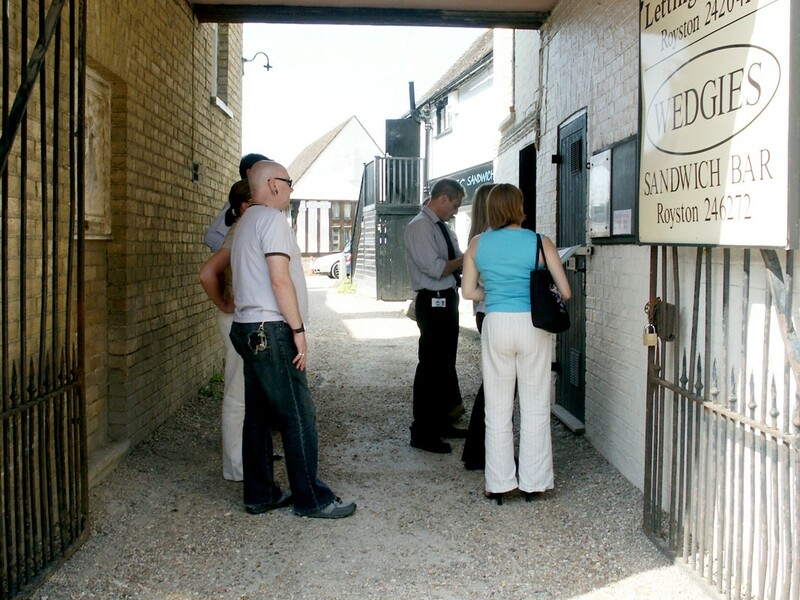 The complaint came from Royston Town Council, the owner of the cave, which suggested that I was making unkind statements about people in the town that gave the impression were official statements. That was not the case, of course: Bad Archaeology is a site that I run as a hobby, which is done in my own time and which is not in any sense approved or endorsed by my employer. Nevertheless, I placed a disclaimer on the main page. Two more complaints followed, accusing me of misrepresenting the work of others, of failing to read the relevant publications and of pursuing a campaign of disinformation. I happily corrected a few factual errors that were pointed out. However, it has been clear to me since the first complaint that there is a faction that wants to see my article expressing scepticism of supposed Templar links taken down because it questions the current consensus. Next Why are the “Dropa Stones” the most searched for subject on Bad Archaeology? One clarification – was the Stukeley discovery separate from the 1742 clearance? I think a phrase was missing from that sentence. Yes, it was a later visit, but still in 1742. I’ve now updated the sentence. Thanks for pointing out the ambiguity! Very nicely written piece and shows perfectly the calm, rational and reasonable attitude that makes me want to come back and read your views. As a writer and day-dreamer I like to believe in the possibility of most anything and am willing to accept great leaps of logic and ideas, but in reality there is verifiable fact, there is deduction and simple observation and intelligent people would make their decision based on these and like grounds. Unfortunately far too many people historically and even today in this “more aware” and “connected” world are a lot happier believing in the unanswerable and unprovable and obsessively will jump to believe/follow stories with a real big-bad, a god/devil, something, anything bigger then us all that controls and manipulates all things at their whim and thus can be either blamed for all bad things or thanked for all miracles and good things (regardless of any logical connection between them)… I think it’s a fear of the unknown and death and an extension of our religious fanaticism where it feels safer somehow having something identifiable/humanised that sits above us – either to worship or to curse and blame and pray/work to foil. Just me views, sorry, did not mean to carry on so… thank you for a rousing read, will be back next time! As producer of the series you mention, we did commission two GPR surveys in Royston. We did find some evidence of a second cave as you mention on the second survey. The programme was never intended or commissioned for broadcast. Not quite sure where you got your information that the series was centered around a masonic or any conspiracy theory come to that…we were simply investigating the possibilities of Royston Cave, along with a number of other Templar and Masonic places of interest. I note that you do point out supposed similarities in the carvings at Royston , we did notice very similar carvings at Guildford Castle, which do apparently date back to the early 14th century. The series is still an ongoing project with 13 new episodes currently in production. There may well be a bit of sensationalism on the promotional material, a necessary layer I am afraid, to attract the interest of a wider audience…. I read (borrowed, never bought) bad archaeology books and watch (again, only if free) bad archaelogy tv series just to go back and read the debunking sites afterwards. I really like seeing how the sensationalist claims are brought back to their origins and then calmly debunked based on scientific evidence.